I keep hearing more and more people talking about Modern and how they are starting to enjoy it. I find myself wanting to play Modern over anything else too. Modern is in a healthy spot right now. Sure, we have some tier one decks like Tron, Grixis Shadow, Storm, and Eldrazi Tron, but then we have so many Tier two decks in this format. What’s great about Modern is the Tier two decks can easily win any given tournament. You combine that with Standard being stale and we start seeing the reason why Modern is so popular. On top of all that, people are still brewing in Modern and finding new cards or even decks to compete with. I feel like I can’t go two weeks without seeing some awesome looking deck someone came up with in Modern. The format can have some games that are pretty uninteractive; but, for the most part, it seems that decks are starting to interact more and more. Speaking of interaction, today I’m going to be talking about one of the most interactive cards in Modern, if not THE most interactive card in Modern. Glittering Wish. Glittering Wish takes us way back to the days where wishing was a thing. I remember the first time I cast Cunning Wish. I was equally amazed as I was overwhelmed, I had so many choices to chose from! For those that do not know how wishing works, let me explain. In a match of Sanctioned Magic when you cast a card like Glittering Wish you are only allowed to choose a card from your sideboard, this is typically known as the “wishboard.” Wish decks would transform their Sideboard to become more of a toolbox instead of a normal Sideboard. This would allow them to have a lot more answers and threats in all their games. The cost? A Green and a White mana, at least for Glittering Wish. 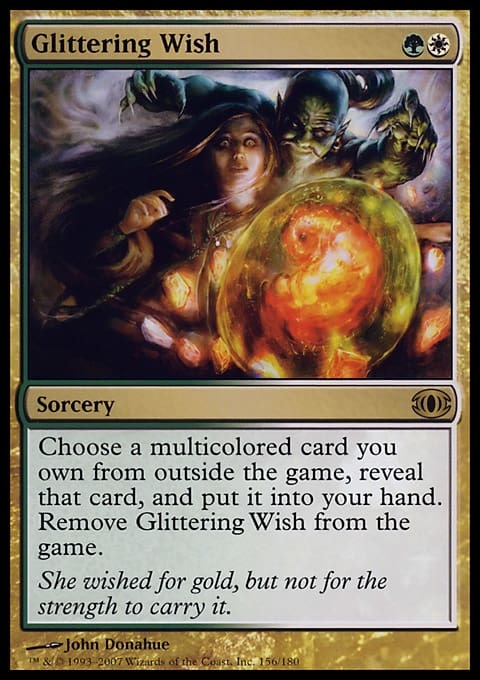 Glittering Wish is the only “wish” card we have in Modern and it’s one of the best. We have access to so many multicolored cards that we can essentially get whatever we need if we’ve built our Wish board correctly. The one downside to having bullets for Glittering Wish in our Sideboard is that we no longer are bringing in many cards when we Sideboard since most of them will be targets for Glittering Wish. It’s a fine tradeoff to have an answer for almost anything. In the past, Glittering Wish has been used in some Midrange deck, but nothing stuck. Jeskai Ascendancy combo used Glittering Wish but that deck has fallen out favor, mostly due to the banning of Treasure Cruise, Dig Through Time, and Gitaxian Probe. So why am I talking about Glittering Wish now? Well, one, because it’s a sweet card! Another because friend of mine, Francesco Amati and his friends have been doing very well with a Bant Control deck featuring Glittering Wish. I know you’re ready for the decklist, so here you go! Before I give you my thoughts on the decklist, I figured I’d ask the creator himself some questions. Rather than assume, we will know. Here are a few questions I asked Francesco Amati and what he had to say about his deck. 1. What is this deck based off of and why did you decide to play Glittering Wish? This deck is based off BennyHillz’s (MTGO) established Control shell. I decided to play Glittering Wish because I was looking to address the archetype’s biggest culprit in Modern: variance. In theory, Glittering Wish seemed like a powerful way to adapt to variance and different situations by having access to relevant answers and threats, especially Game 1. 2. How does the deck function? The deck functions similarly to Control, but Glittering Wish allows you to transition between separate roles depending on the game-state and deck you’re up against. You can control the pace of the game by adopting a beatdown plan or grinding it out through various control elements. The key was to design a strong and consistent core that could function without Glittering Wish, but versatile enough to complement the Wishboard and support a transformational plan. The main and side need to flow, which has taken a lot of fine-tuning and balancing. Learning how to sideboard with Glittering Wish is the deck’s most notable challenge. It’s also important to keep in mind that Glittering Wish is the icing, not the cake. 3. What are the decks bad matchups? The deck’s toughest matchups are 5c Humans, Elves, and Breach. These decks present their own unique set of challenges that either require more removal or counters. For instance, Breach is unlike other combo and big mana decks where Runed Halo is effective, such as Storm and Shift, because Breach attacks from its own axis. Remember to diversify your removal and sweepers vs 5c Humans and Elves. Condemn, Porphyry Nodes, Engineered Explosives, and Wrath of God are solid options. Burn can be tricky, too, but counters and bodies helps. Even Runed Halo can be clutch to fend off early aggression from Goblin Guides or Monastery Swiftspears, or to name Eidolon of the Great Revel. Consider playing Dispel and Blessed Alliance if this matchup is giving you trouble. Lastly, Lantern Control requires some of the tightest play and focused plan, but it’s manageable through early pressure and keeping them off Ensnaring Bridge and Pithing Needle, which is why Artifact removal is prioritized here over Stony Silence. The same can be said about Storm — apply pressure and keep them off Grapeshot and Empty the Warrens through counters, Runed Halo, and sweepers. 4. What are the decks good matchups? The deck has several good matchups from Control variants, to Jeskai Tempo, Grixis Death's Shadow, , Affinity, and Eldrazi Tron. Believe it or not, even Tron and Shift have been good with our ability to Wish for Geist early and making them stumble through land disruption, counters, Vendilion Cliques, and Runed Halo vs Shift. This plan cross-performs against both matchups. 5. Why only 3 Cryptic Command?! Blasphemy! Haha I don’t know if I’d play 4, but I wouldn’t go below 3 here. The card does it all and has sweet synergy with Runed Halo, Spreading Seas, and Detention Sphere. 6. Do you really think the first Settle the Wreckage is better than the third Supreme Verdict? The single Settle the Wreckage is a concession to 5c Humans, Dredge, and Living End, which are all on the rise. The card also complements our transformational plan with Geist of Saint Traft, Sigarda, Host of Herons, and Dragonlord Dromoka as we’re able to deploy a threat and clear the field with a one-sided sweeper. 7. Last question — why no Tarmogoyf? As I stated earlier, consistency and stability are key to this deck’s design. I wanted to remain disciplined and focused. I didn’t want to dilute Control’s core, or go too deep into Green. This would stress the mana base and make it difficult to effectively play utility lands, such as Field of Ruin. The most Green-based spells I’d play in the main is 4. In terms of Tarmogoyf, I’ve always found it to be underwhelming in decks without discard or that don’t aggressively fill up the graveyard. 8. This deck is sweet! Thank you for taking the time to answer these questions. Would you like to thank anyone? Thank you! I’d like to thank a few players in my community on Facebook for helping me optimize UWish. Shoutouts to Dylan Brown, Tom Dowling, Care Serene, Darrel Feltner, Richard John, Anthony Sayre, Michael T. Butler, and Kevin Liu. All right, well thank you Francesco for taking the time out of your day to answer these questions for myself and all the readers, it’s very much appreciated. I can’t wait to give this deck a whirl myself. Now that we have Francesco answers and explanations, I’d like to give my opinions. Keep in mind I don’t have the reps with this deck that Francesco does, but I have played plenty of control decks and I like to think I have a decent grasp on them. I am a believer that if you are playing a heavy Blue based control deck in Modern, you need four Cryptic Commands. It’s the best card you have access to as a control player. I also like the third Supreme Verdict over Settle the Wreckage, this is only because I expect to face more Jeskai Geist decks and Grixis Shadow than I do Dredge or Humans. This is obviously meta dependent and I am basing my meta off a SCG Open or a Grand Prix. For your local meta, you’ll need to adjust accordingly. I’d also run a singleton Alchemist's Refuge, I’m just a huge fan of that card. Instant speed Supreme Verdicts or Glittering Wish gets me excited! The only other thing I’d consider changing is removing the Lumbering Falls for another Misty Rainforest. Other than that, the deck very solid, if you like new takes at control, you should try it out. The last thing I’d like to do is give a potential Glittering Wish targets in case you want to play them or the metagame shifts in the future. Here we go! These are some of the cards you could consider for this deck. Obviously, some are better than others, but I figured if I was going to make a list, I might as well make a list. Anytime I need to look for potential targets for Glittering Wish in my Bant Control deck, I can come here. The one that appeals to me the most out of here is Dromoka's Command. It’s cheap and can act as anti-burn, enchantment removal, or just as a fight spell. Grand Arbiter also seems decent against Storm decks. They’ll need a bear to combo you. Choose your wish weapons wisely! Well ladies and gentlemen, we’ve come to an end. I hope at the very least Glittering Wish peaked your interest. I know it has for me.